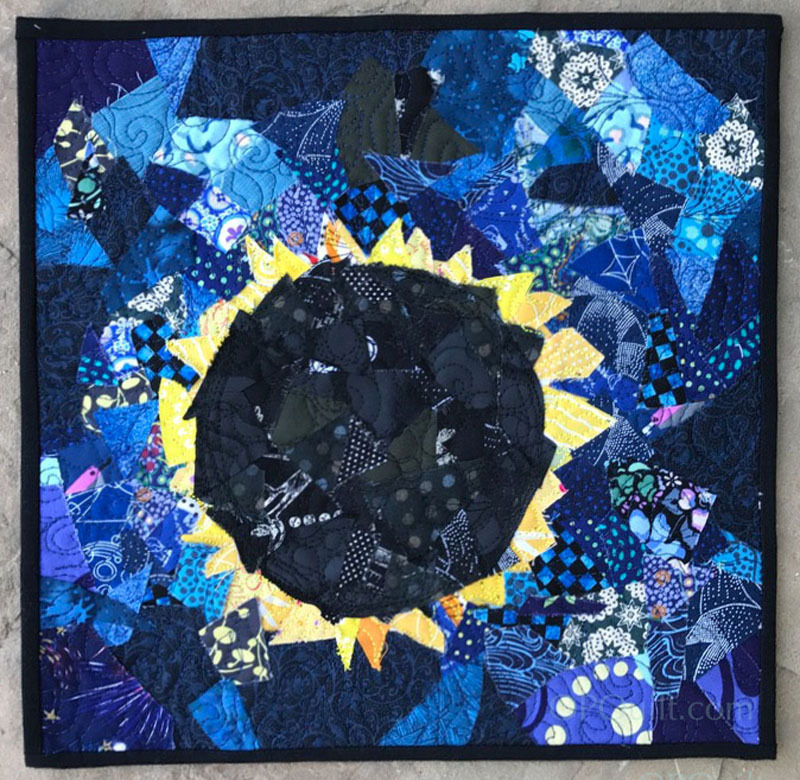 November | 2017 | OccasionalPiece--Quilt! Posted on November 29, 2017 by Elizabeth E.
This is the second post on shopping for fabric in Toyko and South Korea. My last post talked about the famous Tomato Fabrics and Nippori Fabric Town. It looks like I’m standing in a fabric shop. However, it is a tenugui shop, a place that sells fabric that is narrow in width, with unhemmed ends. A tenugui is translated as a “wiping cloth” and is used for bandanas, napkins, drying towels, and this place also sells really long tenugui that can be used as scarves. This shop is found in 2k540, an artisan collective near Akihabara station. These are the two tenugui that I purchased, and below is the detail of the one on the left, with its subtle coloring. They are about two feet long. I plan to wash them up before using them in my sewing, or maybe I’ll just leave them in the kitchen downstairs for some fancy dish drying. My husband gave me these a couple of years ago, and I didn’t understand what they were for. Now I do. If ever I go to Tokyo again, I’m headed here: Yuzawaya in the Ginza area, although I understand they have other locations. I used my Google maps to get to Ginza Core, the tall building in the middle of the photo. I walk in and a young woman all dressed up, even with a hat, is at the “concierge” desk for the building. I show her the name and she says “Oh, yes. Sixth floor.” I keep forgetting that different stores can be on any floor here. The elevator opens onto this scene. Wow–a real fabric shop. I don’t know if they allow photos, and I don’t have the language to ask, so I kept taking undercover photos as I walked around. They have yarns, embroidery, crafts, magazines, notions, fabrics, woollens for mens’ suits, patchwork (what they call quilting) and so many other things. You can see the button wall on the upper left in this photo: rows of boxes. I imagine someone might have to help you? but it does look self-service. There was someone just to the right of me, kind of blocking access, otherwise I would have plopped down and spent all evening looking through these magazines. Tiaras…just in case. Obviously this was the bridal section. Fur trim is big here. I didn’t see any mink balls here, though. Blue and white fabrics–maybe from Japan, but possibly from China. Quilting cottons and their equivalent of fat quarters in front. 180 yen is about $1.60, and these pieces are suitcase-sized, coming in at about 14 by 19 inches. Regular sewing fabrics. I wonder if you have the sales clerk pull the bolt for you after you give them the number. This is the real challenge in shopping in a foreign country: you just don’t know how things are done. After being in Tokyo for a few days, it gives me much greater appreciation for visitors to our own country must experience. Men’s suitings. I had picked up a basket while shopping, but was determined that I would not buy any more things than would fit in the small basket; I got pretty good at packing it in. What did I buy? I bought this gadget, that will help you make clutch purses without getting your fingers all full of glue (brilliant gadget). They use a string to help tuck the fabric into the frame–all the frame kits and the string. I bought two sets of purse handles, as they were selling about 75% cheaper than what I can buy in the states, plus the above fabrics. The French fabrics on the lower right are coated, so they’ll make a nice lunch sack. I found fabrics from Japan, France, Scandinavia, and some bits of American fabrics, but not much and all the prices were reasonable. Next fabric challenge, in a new country: Dongdaemun Shopping in Seoul. Wikipedia tells me that “Dongdaemun Market opened in July 1905 in Yeji-dong whose name means “a neighborhood for learning politeness”, so the market was originally called Baeugaejang (“market for learning”)….The market sells all types of goods but notably silks and fabric, clothes, shoes and leather goods, sporting goods, plumbing and electronics, office supplies, fortune tellers, toys and food areas specialising in Korean cuisine. It also has many pet shops. We went over in the afternoon, not knowing about their 5 a.m. closing time. We came up out of the subway using Exit 9, and I’d done some research that told me to look for the J.W. Marriott and it would be to the right of that. That white gridded building with the yellow-lit area underneath is the Marriott. But there were also two uniformed, English-speaking guides standing at the subway exit, and they helped us find our way. This side of the river is the fabric shopping. I understand that the other side, that massively long building is clothing. Maya, an IG friend who we’d met for lunch in Seoul, had all sorts of tips for Seoul, and we found her advice really helpful. Basically each stall has a number, led by the floor number (so 5018 is on the fifth floor). There’s also a building number, as you can see. But truthfully? Once you get inside, give it all up. Just wander. We did eventually find the booths that Maya tipped us off to, as well as about a fifty-thousand others. (There are multiple blog entries about this place–just Google it.) It’s a market made for business, but they put up with the rest of us. Because I was in love with all things hanbok (their traditional dress), we happened on the booths selling their fabrics. In the neighboring booth, a young woman was being measured for her own hanbok. The renowned Happy Quilt booth. If you ever want to go here, keep track of the number on the sign overhead. Booth after booth after booth for as far we could see–this place was huge. Many booths just had swatches of fabrics, and if you liked it, they would call the warehouse, get it cut and deliver it to your hotel. If you got like 60 yards, they would deliver it for free. I like to bring home a piece of jewelry from my travels, but from what I could tell, the women in these two countries don’t wear a lot of costume jewelry, except for pearls. So we stopped at this booth and picked up some polished stones, another booth (below) had cording, and I’ll make myself a necklace. It’s about now — after walking forever inside, realizing that we’ve only touched the very edge of this area for shopping — that it dawns on us that so much of our fabrics and our clothing must come from this area of the world. Of course we know that, given that America labels all its clothing and purchases, but that is not usual. But from now on when I walk into a fabric shop in America, I’ll remember that much of what I see had its genesis from this area of the world, maybe even represented by one of these little booth sellers in this massive building. Dongdaemun also has this huge plaza with buildings designed by the famous female architect, Zaha Hadid. Apparently every one of the panels is cut to a different size. All I could think was: quilt design. This was our last night in Seoul, the end of our Asia trip, and all I wanted was a meal from Shake Shack. I guess you could say I was ready to not have to be adventurous in my menu choices anymore, ready to go home, ready to grab the rotary cutter and explore with fabric some of the designs I’d seen in our travels. I have one more post from our trip, about our visit to the Quilt Museum in Seoul. 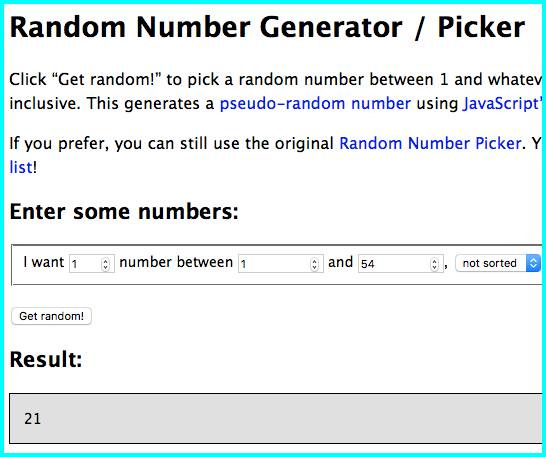 Also coming up: the drawing for the zippers (tomorrow morning) and I’ll contact the winners by email. Thanks for reading, and thanks for your interesting comments. You are all a well-traveled group! 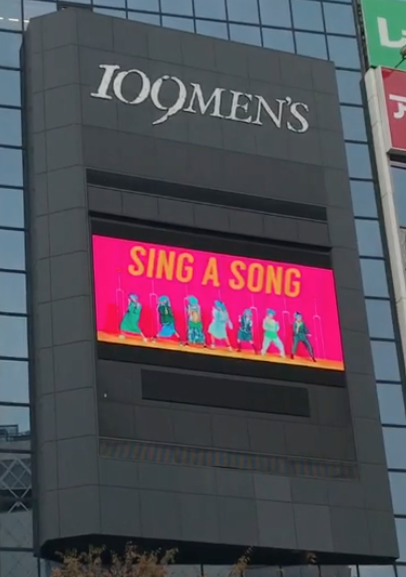 Posted on November 23, 2017 by Elizabeth E.
It’s from a video taken at the Shibuyu scramble crossing, a place I went to on my recent trip to Tokyo. The advertisers must pay Big Bucks to have four screens going at once. I have to admit, I like the Ginza scramble crossing better (above), although I never got a video with people crossing, as I was always there early in the morning, before the rush. But we’re here to talk about the fabric shopping. I found shopping in three different places: Nippori Fabric Town (the nickname), Yuzawaya (an elegant store, 6th floor, Ginza area), and a place you might not think of: buying tenugui, or wiping cloths, in an artisan shop near Akihabara. Here are three large files of the map of Nippori Fabric Town, 2017 version (click on each picture to enlarge it). I had printed out an older version of this map and taken with me, so this might help someone; these maps are available in many shops. True confession: I didn’t shop the entire street, as my time was short, so I will only share my experiences with part of the street. But the real godsend was the portable wifi hotspot we rented, which made our lives infinitely better while traveling in a place where you don’t speak the language (although there is a lot of English around, once you figure out where to look). My Hyperdia map (and Google map) said to exit the South Gate. Where you exit in the Tokyo train stations can be as critical as to which train you take. I had to ask once for help, and they redirected me, for even though you have the maps, you still get lost. Check out the guy rolling his suitcase down the little ramp next to the handrail. Come down the stairs, go across the street, then proceed straight at the next street. The first Tomato shop was my favorite. The fabrics were nicely organized, the shop was clean, the sales staff had a smidgen of English and were very helpful. The down side of shopping on Nippori street is that the minimum purchase is 1 meter. When I’m home shopping, and I have the back of my mini SUV to throw all my purchases in, this is not a problem. But when I’m traveling overseas, and I have one small suitcase, slightly bigger than the size of my dresser drawer, this is not happy news. I figured if I got desperate, I could leave half a meter of each fabric behind, but instead I left my pajamas behind, rather than part with any of my fabric (and a blouse in Incheon was abandoned, but that was a mistake: always check the closets, she now says). Why is she wearing a face mask? It’s complicated. But you see it everywhere. At this shop I purchased these fabrics. I made sure that everything I purchased was made in Japan, and I loved finding fabric by Keiko Goke and Yoshiko Jinzenji. The sunflower print fabric, one a canvas and one a quilting cotton, are by Suzuko Koseki, with Yuwa again being the manufacturer. One down, more to go. I’d asked the ladies in the above picture which Tomato shop had “patchwork” fabric, and headed that direction. This shop wasn’t it. This was the 100 yen shop, or 1 meter for 100 yen. At this time, we estimated that 1000 yen was roughly 9 dollars, so 100 yen was about 90 cents. This is where I started to fall out of love with this adventure. Again–if you are local, it’s bliss. If you are a foreigner, with limited cash and space, it’s not really helpful to have a lot of fabric that is sort of clearance stuff, upholstery stuff, etc. How can you possible carry home 3 yards of fleece, even if it is incredibly cheap? I moved on to this Tomato Shop, with five floors. (Doesn’t it make your heart leap to see all these rainbow colors, even if it is just fabric for dress lining?) I passed on the American fabrics, for I learned that I’m just not keen to pay $20 bucks for a yard, and instead concentrated on local fabrics, of which I found plenty to choose from. Final Tomato store was a lot of fun. While I was waiting to be checked out, I took a snapshot out the window of this electrical pole. A work of high-powered art. Dots are universal. I had obtained a rolling cart from a helpful employee, loaded it up with cute Japanese Christmas fabric and rolled it carefully to the cutting table, having checked to make sure I didn’t have the kind of tag that indicated I’d have to buy a meter of each. Wrong. I had to buy a minimum of a meter of each (above). I put half of the bolts aside, and purchased four pieces, instead of the ten I’d picked out. Even after I’d bought one meter of fabric, he wouldn’t cut a half of the next. One meter per roll. I wandered through the remaining Tomato shops, feeling very much like it was warehouse shopping, and didn’t buy anything else. My backpack was heavy, and it was only the 4th day of my trip. Space would be a problem, for sure. When they say there are over thirty shops here, some of them are like the one above: leather skins hanging out front, along with mink balls, and a dingy interior (where the owner was slurping his ramen). Halloween? Traditional Costume? With one black hand, one white hand? Time to go home. I retraced my steps back to the Nippori Station, a combination of old and new. New, in that they have the barriers at all the track edges, and old with the arches. When I came back to my hotel, I noticed this little shop. Always when I’d passed by it, early in the morning on the way to the subway station, the rollup metal door had been down, and I hadn’t known what was behind it. So later that afternoon I went to see what was there. It had Liberty Fabrics, sashiko embroidery kits, lots of stitchery kits–a very charming shop in a very small space. The employees knew about 5 words of English, a larger vocabulary than my pitiful Japanese, but they were unfailingly polite and tried to be helpful, always smiling. I wanted to pretend to speak French or German…anything but be associated with this person, who had not figured out the basic rule of Japanese consumerism: Don’t Touch the Stuff. Seriously. You can ask them to show it to you, you can lightly gesture towards whatever you want to see and if they give you a nod, then proceed, but we Americans like to shop with our hands. Touch touch touch. And one more rule: be nice. I accepted all my packages this week with both hands. I offered up my credit card with both hands. I took the receipts given back to me with both hands. But rarely did I ever touch anything in a shop without their permission. Woman A ended up leaving without buy a thing. I also learned to let the shop know that my purchase was a gift, and the simplest wrapping job — in this case a cellophane bag with a piece of paper, a little bit of ribbon with a sticker — became a work of art to take home. This little bit of Japan in my suitcase was far better than yards and yards and meters and meters of wadded up fabrics. Next post: Yuzawaya, Tokyo Shopping Heaven, and We Venture into Dongdaemun, in Seoul. Posted on November 10, 2017 by Elizabeth E.
It wasn’t until posting these up that I found two errors in these quilts. Isn’t it funny that you don’t see things…until you do? (Hint: it’s in the bushes.) I love the rainbow quilt made by my friend Lisa. I may have to make one for myself. Posted on November 5, 2017 by Elizabeth E.
This is the post where I reveal all my beauty secrets. Kidding. 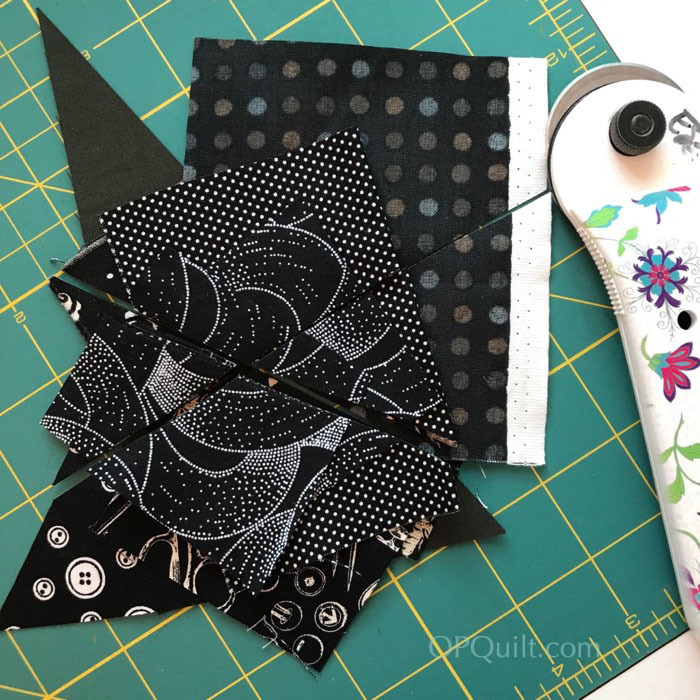 This is the post where I tell you how I made my Four-in-Art quilt, showing a technique I’d read about this technique somewhere, but that crazed-woman-at-the-computer didn’t bookmark it or file it away neatly. So I had to wing it, which is okay. First, cut yourself a square of black fabric. I used the wrong side of a fabric that I hoarded about 15 years ago, and I’m still trying to get rid of it. (It’s a great fabric, really.) 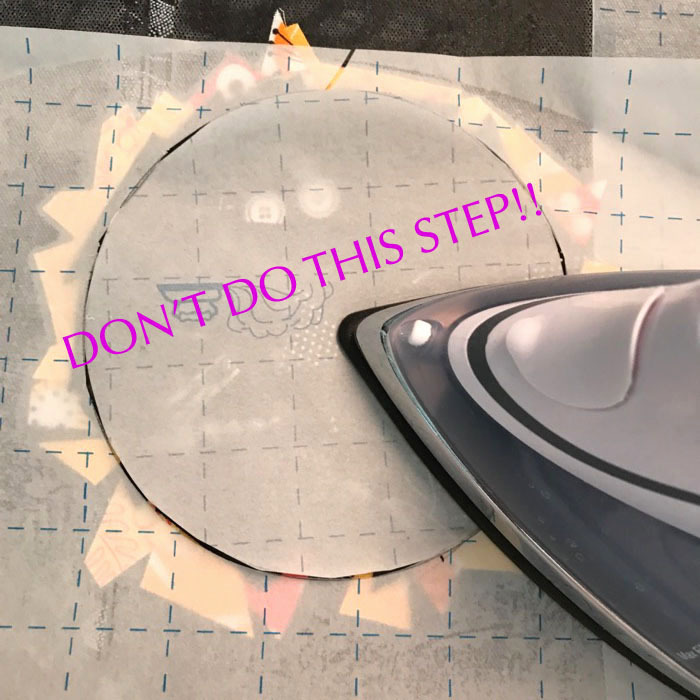 Then get yourself some Steam-A-Seam II, the fusible applique stuff that will be sticky when you lift up the transfer paper, after you’ve ironed it on. I did check to make sure that I adhered the non-release side of the Steam-A-Seam II, leaving the side that would release easily facing me. Gather together some scraps in the colors you want to place on your background. Since I was doing the eclipse, I basically had three: yellow, black, blue. Throw in some related colors, just to keep it interesting. For me, that meant some lighter blues, and orange. 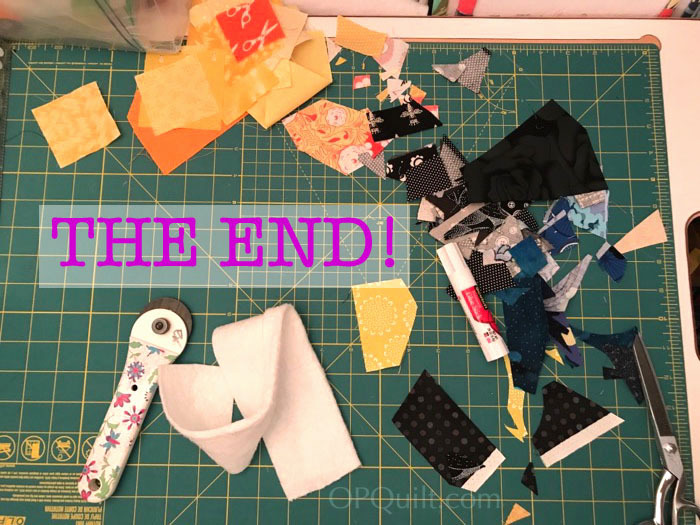 Pile up your color, then randomly cut through the fabrics, and then do it again. You need some bigger pieces (1-1/2″), but also lots of smaller pieces (1/2″). I traced a circle on my paper, slightly off-center — because none of us saw that eclipse dead-center — and cut out a hole out of the paper backing. 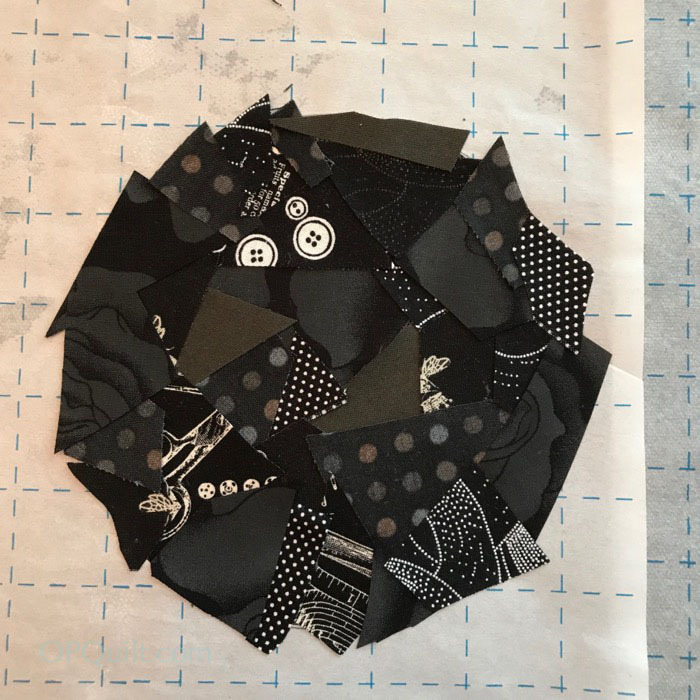 I laid out my black scraps, making a loose circle. Then I tucked my yellow/orange sun flares behind the circle, pressing down with my fingers to make them adhere to that sticky surface. I went to the ironing board and ironed it all down. WRONG. 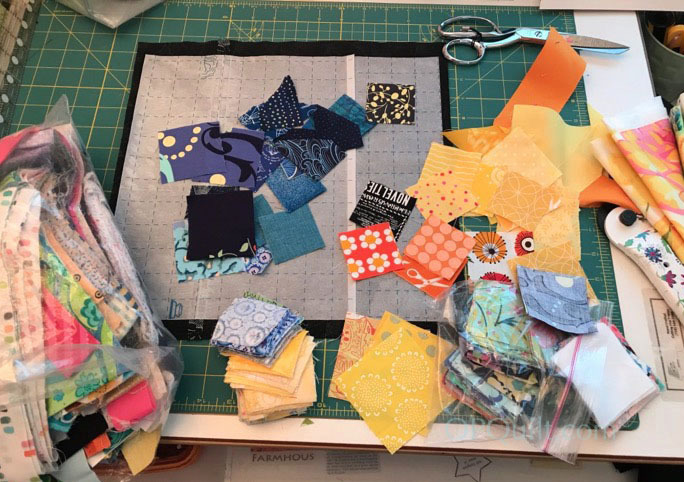 While this seemed like a good idea, you know–to make sure all those pieces were not going to go anywhere — in reality it prevented me from lifting up the edges and tucking in more yellows, and the blues. So maybe if you can protect the edges of your design from the hot iron it might be a good idea? Or just wait until the end? Add in your bits and pieces, filling up the background in a random, organic way. 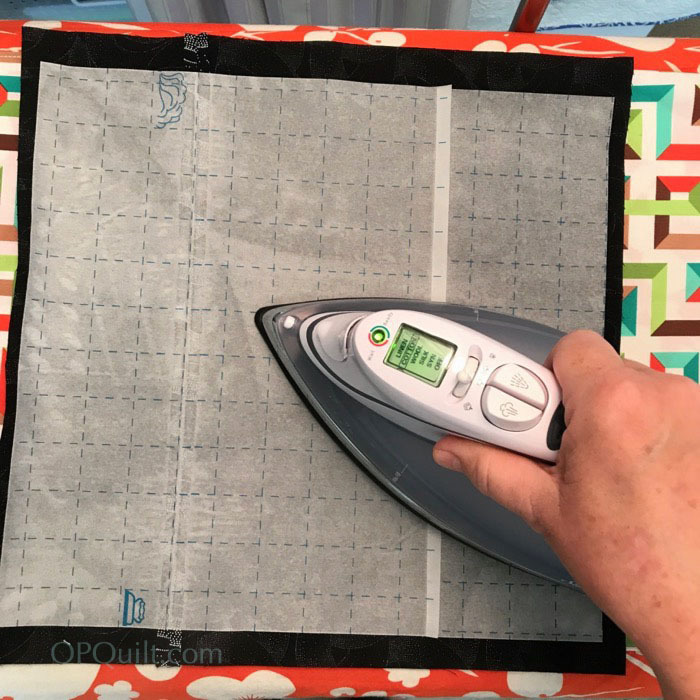 NOW go to the ironing board, lay your transfer paper over the design (the crackly sheet that came with your fusible), and press, lifting up and down, not sliding, until you think it’s adhered. I used three different colors of thread, and just scribbled free-motion-quilted the pieces down. I did a series of circles in black in the moon, the followed the shapes for the solar flares, then a random loopy design in the heavens. This is where I notice that the moon has two eyeballs staring right at me. And this is where I go get some more scraps, use a regular old-school glue stick and paste more fabric scraps over the eyeballs (you don’t see it in the first one, do you?). Quilt, again. And then I thought that the moon looked more like a black lump of coal than the moon (even though it does have a mountain-y horizon…it’s not THAT bumpy). More scraps glued on, more FMQ. I finished up by going in giant circle around the perimeter of the moon, to reinforce that Orb in the Sky thing. Well. Not quite. But that’s what my work table looked like after I trimmed it up, bound it, and made the label. I’m a total believer in a clean workspace at all times. I’m a total believer in a clean workspace at least once every couple of weeks. I mean, I’d like it to be all the time, but I create in small room, and I decided to adjust to the life I have. Hope you’ve enjoyed the Deconstruction Post for the Final Four-in-Art Quilt. I probably won’t leave the art quilt in the dust, though, as it’s a quick way to make a quilt while trying out a new technique. Given that it is often smaller (most of mine were 12″ square), you can crank one out in a day, or an afternoon, if your design is not too complicated. Thank you for coming along on this five-year journey.